Alter The Press! : Fall Out Boy and 5 Seconds Of Summer Collaboration Will Happen "Eventually"
Fall Out Boy and 5 Seconds Of Summer Collaboration Will Happen "Eventually"
Fall Out Boy have revealed that they plan on working on music with 5 Seconds Of Summer in the future. In a new interview with BBC Radio One, the group said they keep 'trying' to hit the studio to work on new music with 5SOS, but admit it's all a matter of 'timings' and making sure their schedules match up. "What's crazy is we keep trying to have it happen, then it doesn't happen. It's one of those things," Patrick Stump said. 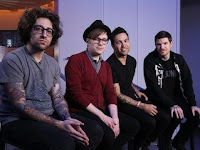 Guitarist Joe Trohman added: "It's timings and stuff. It'll happen eventually."